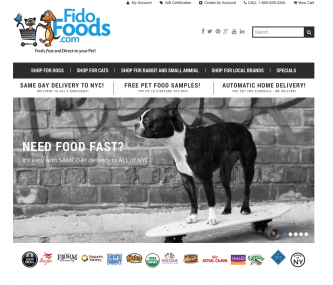 Fido Foods announces same day delivery of pet food and supplies to all 5 boroughs of New York City. The company is a web based retailer with offices in New York City and Long Island City. The company is offering a service similar to Fresh Direct but for pets. Fido Foods plans to focus on its core business model of specialized delivery service tailored to meet the most discriminating of pet parents in NYC by carrying high end organic and holistic pet food brands and luxury pet products. NEW YORK - Oct. 18, 2014 - PRLog -- Fido Foods a retailer of luxury pet supply brands and organic holistic pet foods is excited to announce the launch of their new website FidoFoods.com – a web based platform to order pet food and pet supplies in New York City with delivery service to its customer’s front door in all 5 boroughs - same day. The company launched its website which can be utilized via desktop computer, tablet or mobile device. The service allows pet parents to easily order their pet’s food or supplies 24/7 and have them delivered to their apartments, homes, businesses or hotel room with the simple click of a mouse or tap of their finger. The company sees tremendous growth in large metropolitan cities where there is a high demand for convenience, ease of ordering, quick and flexible delivery times and a large selection of top quality pet nutrition products. “If you live in a walk-up building here in NYC we can schedule the delivery around your schedule or if you have a doorman we can leave the package with them, which is a huge factor of convenience in a city like ours. Think of us a Fresh Direct for pets, just click, purchase and schedule a convenient delivery window to receive your pet food,” the company says. FidoFoods.com also offers an automatic scheduled delivery plan in which customers set a regular scheduled delivery date of their choice and time so they don’t have to worry about running out of pet food.